One person’s trash can be another’s treasure, as the saying goes. And now one of the fashion industry’s fastest-growing sectors is helping prove that point. The secondhand clothes market in the United States has grown 21 times faster than retail sales of new clothing over the past three years. It’s currently worth in the region of $24 billion and is expected to reach $51 billion by the middle of the next decade. For many, buying secondhand clothes used to have a stigma attached: you shopped in charity shops and thrift stores when you had no alternative. Not any more. The resale market for secondhand fashion is a runaway success and it seems everyone is getting in on the act. 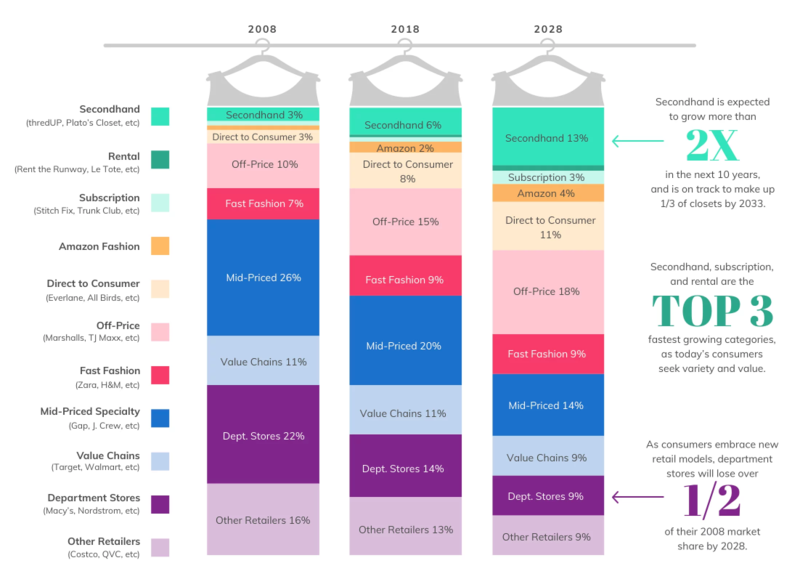 The rise of secondhand clothes. ThredUP’s research found that at all price levels in the sector a consistent proportion of shoppers are buying secondhand. At the luxury retail end, 26% also buy resale items. In the mid-market, it stands at 25% and 22% at the discount end. 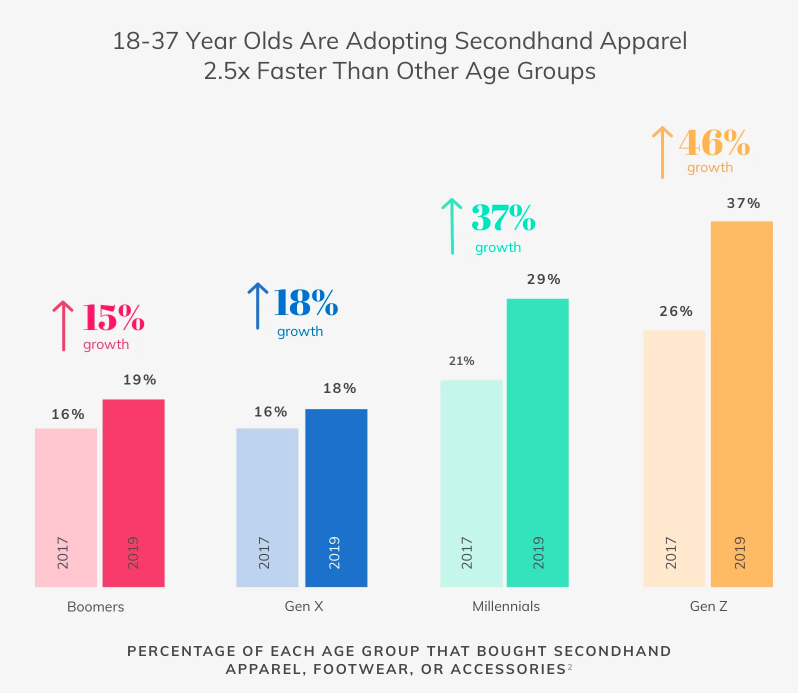 Millennials are the most likely age group to embrace the trend, closely followed by boomers – with 33% and 31% respectively buying secondhand. The generation stuck between those two, Gen X, is a long way behind at 20%, with Gen Z, the new kids on the block, at 16%. But it’s the Gen Z crowd where most growth is expected. One in three people aged 18-24 are forecast to buy secondhand items this year, making them the resale world’s biggest fans. The growing interest in secondhand has been driven by a combination of things. One is technology, with online marketplaces allowing people to buy and sell pre-owned goods, including clothes. A new niche of micro-retailers has sprung up, dealing exclusively on the internet, and not just selling items they own, but buying in stock from other sources too: eBay, Houzz and Etsy are some of the better-known examples. The rise of the conscious consumer is another major factor. Environmentalism has gone mainstream, informing people’s attitudes to the food they eat, how they travel and now the clothes they wear too. ThredUP found 72% of consumers are more likely to buy from environmentally friendly sources. But while eco-fashion can come at a price – one of Stella McCartney’s recycled nylon tote bags will set you back almost $590 – the secondhand sector is offering a wider audience the chance to get involved. 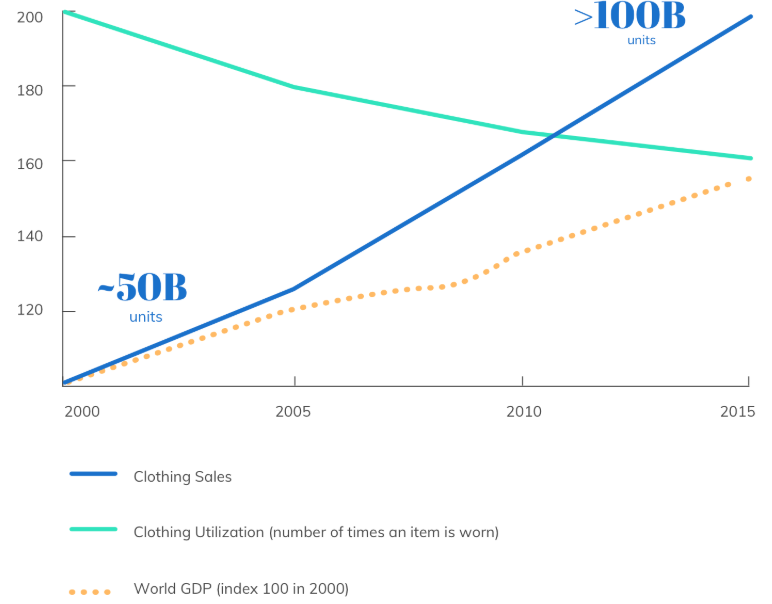 If an item of clothing – or a bag or a pair of shoes – is kept in use and in circulation, the demand for new sales falls. The fashion industry’s raw materials consume vast amounts of resources and leave behind huge levels of pollution and emissions – around 20% of the world’s wastewater comes from the fashion industry. It is also expected to be responsible for 25% of the global carbon budget by 2050. Fashion’s appetite for resources grows as more clothes are bought and fewer are reused. For the retail industry, the booming secondhand sector is the latest in a run of recent challenges. The number of vacant stores in US shopping malls now stands at an eight-year high, with high-profile brands like Gap and Victoria’s Secret closing stores this year as the so-called retail apocalypse bites deep. Adjusting to the exponential growth of ecommerce has undoubtedly been the retail world’s steepest learning curve. Shoppers have embraced the opportunity to buy online, at a time and in a place that suits them, while stores see declining footfall. With shoppers choosing not to buy at all, or at least not as frequently, retailers are going to have to adapt even further to survive. That might not be such a tall order, though, as 87% of senior retail executives told the thredUP researchers they want to get involved in reselling secondhand fashion by 2020.